By Dr Paul R Manning, MA, VetMB, MSc(VetGP), DProf, MRCVS. You will be aware, as will your vet, that there are still many questions in medicine for both humans and animals that remain unanswered. Acupuncture has been around for about 4000 years and was first discovered in India – contrary to many people’s belief that it all started in China. Never-the-less, the Chinese have used the art of acupuncture for thousands of years, and are indisputably the world leaders in the field. In China today, human patients are offered a choice between going to a modern ‘western medicine’ style hospital for their treatment – which includes anaesthetics and surgery, including open heart surgery, or alternatively going to a traditional Chinese Medicine Hospital where patients can have all the same medical conditions treated, but can remain awake while the acupuncturist needles away the pain while they watch the surgeon operating on their body. You may choose ‘not Chinese’ if you are a bit unused to the idea, but you might change your mind when you discover that the Chinese method can save you thousands of pounds in medical bills, and you can be walking around almost immediately afterwards without having to wake up from an anaesthetic. Many clients have been reassured after their cat has received acupuncture because none of the cats I have treated has made any fuss, except perhaps those fiery types that we all know, are unhappy no matter what the vet tries to do to help them! They really don’t feel the needles, they only imagine what their vet might inflict on them – indeed the same often applies to human patients! The thin acupuncture needle is protected by a sheath (shown) prior to treatment. I have found that some clients are curious about how acupuncture works, but most are very happy to know that it does work in many cases and are therefore prepared to give it a try. There are various theories including rebalancing the energies in the body called Yin and Yang; some physiological theories; and just an empirical view that for many years people have found that if a needle is inserted at a certain point or points in the body pain is relieved in the same part of the body. So why would this knowledge and expertise, and 4000 years of experience benefit my cat? 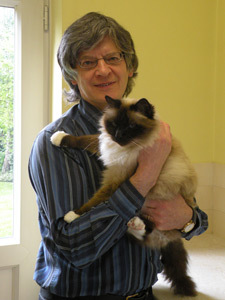 The best example I can give you is from a client who, with her husband, became very concerned in the year 2000 that her cat ‘Cotton Socks’ was suffering from a form of arthritis that was clearly painful, initially undiagnosed which was worrying in itself, and the local vet seemed to have no alternatives to corticosteroids to help. The steroids gave rise to excessive body weight which is a well-known side effect, and also potential side effects such as diabetes mellitus and kidney disease were of serious concern. Cotton became obese, and her body weight reached 6kg. Neither the pain nor her bodily movements were improving. There are some cases which vets (and doctors) cannot easily diagnose or treat. So the local vet referred Cotton Socks off to the Cambridge Veterinary School (2002) where the latest and most up to date diagnostics and treatments were likely to be available. A diagnosis of Rheumatoid Arthritis was made from a blood test, which detected the presence of Rheumatoid Factor (RF), and physical examination. Cotton Socks was weaned off the steroids over a period of weeks, but no alternative medical treatment for arthritis itself was known. A helpful member of the Cambridge veterinary staff mentioned that acupuncture was often used in the USA for this condition, but he was unaware of any vets in the UK who practised it. 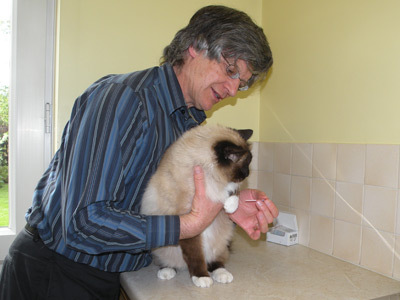 Cotton’s owners were desperate to try anything to help alleviate the pain and discomfort being suffered by their much-loved feline companion, and following considerable research by them, Cotton was brought to Newport Pagnell in North Bucks to see me in October 2002. The treatment with acupuncture involved inserting needles along the spine, and in a few other places to help relieve the pain. Acupuncture has identified many points in the body and mapped them out in terms of what are called Meridians. Meridians are not joined up. Lines like nerves, but are maps to help locate points of which points can be needles to achieve benefits. Key points in Cotton’s case were what are known as the Governing Vessel Meridian points GV2, Bai Hui, GV3, GV4, GV5 along the dorsal midline running from the base of the tail towards the head up to about the level of the ribs. Another point that was useful was the K3 point in the hind legs just above the hock which is sometimes known as the ‘aspirin point’ because it can produce general pain relief. BL60 was also used in a close proximity to K3. LI1 in between toes of the forelimbs was used as well, although that was the point that Cotton did object to slightly. This was repeated on 3 consecutive weekly visits to the vet doing the acupuncture, and the client admitted that she wasn’t surprised it had no effect at this point because she was extremely cynical about acupuncture in spite of following the recommendations of the Cambridge Vet School clinician. After we gave Cotton one last try with the acupuncture for the fourth time, Cotton could jump and run around again. Subsequently, acupuncture was repeated every few months just on single ‘top-up’ treatment sessions, and subsequently at longer intervals when pain relief was required. Cotton lived to a very ripe old age (passing away on the 12th January 2008 aged 19 and ¾ years). She had also developed other problems including diabetes and hyperthyroidism which were treated and managed with Western Medicine very successfully. The ability to wean Cotton off the steroids with the use of acupuncture was a very important part of the clinical management of this case for reducing the body weight carried by the arthritic joints, for managing diabetes, and for minimising and delaying the onset of kidney disease. The acupuncture relieved the pain from arthritis and helped to minimise the development of other diseases where no other treatment could. There is some research which shows that the immune system is altered by the use of acupuncture in Rheumatoid arthritis. Zunhui (1995) found that in human patients the levels of immunoglobulins (IGA, IgG, IGM) were reduced following the use of acupuncture in patients with RA, and this correlated with the level of clinical improvement. In Cotton’s case, I checked for the presence of Rheumatoid Factor(RF) after the acupuncture and improvement, but RF was still present. This indicated that although the acupuncture could significantly improve the patient’s quality of life, it did not cure the condition. However, the use of Western Medicine could not cure it either, so the choice of acupuncture as the preferred mode of treatment was confirmed. Availability of acupuncture for your cats. There are more vets in the UK who are open to the concepts of acupuncture now, and a growing interest amongst some vets is seeing the treatment becoming more widely available. You can always ask your vet about acupuncture, and if necessary find a vet who will take you and your cat for a referral for acupuncture, so please be encouraged to ask about it. Schoen, A.M. Veterinary Acupuncture 2nd ed (2001) Mosby (An affiliate of Elsevier). Zunhui, G. (1995) Effects of acupuncture on immunoglobulins in patients with asthma and rheumatoid arthritis. J. Tradit. Chin. Med. 15:102-105. Dr Paul R. Manning, MA, VetMB, MSc(VetGP), DProf, MRCVS. Astonlee Veterinary Hospital, Newport Pagnell, Bucks. MK16 9BA. www.astonlee.co.uk Member of the Association of British Veterinary Acupuncture. (ABVA). "God invented the cat so that man could have a tiger to stroke at home"